When the wind isn't right for my kites, I keep busy blowing bubbles. 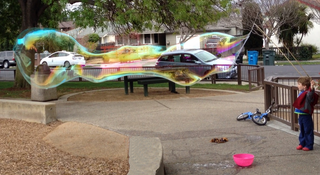 I am often asked what recipe I use for my big soap bubbles. When I was a kid it was just Dawn Dish Detergent, glycerin, and water but then Proctor and Gamble changed the formula of Dawn. 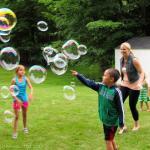 Now a recipe to reliably make big to giant bubbles requires more effort. After a lot of experimenting with so - so results I finally found help on the web through the soapbubblefanciers yahoo group. For lots of recipes, and information on how to find and best prepare the ingredients, visit the soap bubble wiki: http://soapbubble.wikia.com/wiki/Recipes Other pages of the wiki have information about how to make your own bubble wands too. Not interested in mixing your own bubble stuff? I have used the concentrate (just add water) sold by bigbubblestuff, it is good stuff! They have wands in many sizes too. Another concentrate I've used is the Uncle Bubble brand. When you need something that you can count on to just work, this is it. Are you looking for the bubble stuff recipe I use? As of this update in May 2014, there are still two recipes I am using, but one much more than the other. Both make great bubbles so you can pick the one with ingredients that are available to you. I am finding the recipe with Guar Gum to just be easier, easy enough to mix more out in the field when needed. 1. Start by filling a gallon jug about half way with water, mix in Baking Soda. 2. Measure the Guar Gum powder into a small plastic cup, stir in the Isopropyl Alcohol to form a slurry. 4. Pour the Guar Gum/Water mix into the Baking Soda/Water mix. 5. Pour in the Dawn Dish Detergent. 6. Top up the gallon jug with water and mix gently to avoid making foam. 7. Add the Citric Acid. This mix can be used immediately, but may improve with sitting overnight or even an hour or two. Using hot to very hot water can help to combine the ingredients and fully hydrate the guar gum more quickly. Recipe 2 - uses "Brian's Lube Mix"
note: The wiki pages can give you ideas about how to adjust the recipe for different soaps. Follow the link to read about the ingredients and mixing techniques for Brian's Lube Mix. So, you're not interested in hunting down odd ingredients that you have to purchase in bulk? Below is a very simple recipe using stuff you can easily find in North America. (Other simple recipes can be found on the wiki page.) This is a recipe that Brian Lawrence hands out on a card to anyone that asks. His card says, "This is not the formula I'm using today. It's designed to work well, with ingredients that you can easily obtain at any grocery store or pharmacy. If you want the formula I'm using send me email and I'll tell you. The ingredients in it are a little harder to find." around. Fill the jug the rest of the way with water. Let it rest for a day. 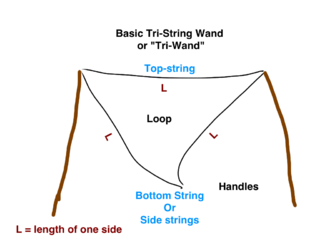 I have documented on the soap bubble wiki how to make a garland the way I do. My method of splicing the bottom line to the top one makes a nice smooth knotless garland that resists tangling when you dip it in the bucket.